One of the busiest airports in Canada, Vancouver International Airport is located on Sea Island, a short distance from the city of Vancouver. Our Vancouver International Airport guide includes useful information regarding airport contacts, terminal facilities, public transport and nearby accommodation options. Customer service counters can be found on the departures level of both the Domestic and International Terminals. Green Coat Volunteers can also assist with queries. Tourism British Columbia information centres are located on the arrivals level of the two main terminals; these can help with accommodation booking, sightseeing and ground transportation tickets. Multi-lingual services are also available at these desks. From the city centre, follow Highway 99 southwards, and then head across Arthur Laing Bridge to Sea Island, where the airport is located. From nearby Richmond, cross to Sea Island via Gilbert Road or Bridgeport Road and follow signs to the terminals. The Link building, which connects the International and Domestic Terminals, provides access between the two. A glass walkway within the Link allows quick and easy connections for passengers transferring between domestic and international/US flights. A free shuttle runs between the International and Domestic Terminals and the South Terminal. 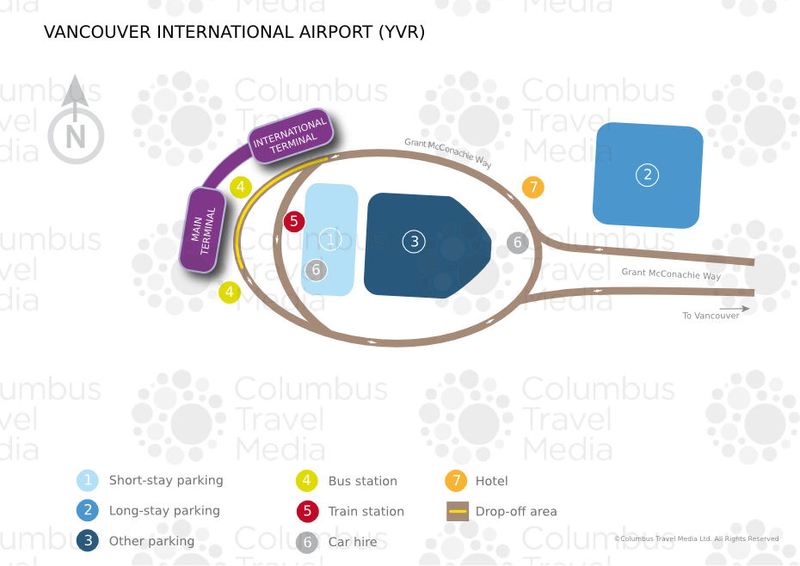 Vancouver International Airport is located 13km (8 miles) south of Vancouver city, in the city of Richmond on Sea Island. Bus: Buses are available from Bridgeport Station and nearby Marpole to various destinations in Richmond and Vancouver city respectively – these stations can be accessed via the Canada Line. Long-distance bus services are available to Whistler and Squamish. Bus schedules are available from Customer Service Counters and Visitor Information Centres in Arrivals. Taxi: Numerous licensed taxi companies operate from outside the Domestic and International Terminals, 24 hours a day. The journey time to central Vancouver is around 30 minutes, and the fare is approximately C$36. Rail:The Canada Line rapid transit rail link (tel: +1 604 953 3333; www.thecanadaline.com) offers frequent services between the International and Domestic Terminals and central Vancouver (journey time: 26 minutes). The fare from Vancouver to the airport is C$4, but the fare from the airport to Vancouver is C$9 due to an additional C$5 'Ad Fare' levied by the transit authority. Late at night, the N10 night bus takes over from the Canada Line services. The Royal Bank of Canada has a branch in the Domestic Terminal and there are ATMs in all terminals. Bureaux de change kiosks are located in the International and Domestic Terminals. A plethora of licensed bars and restaurants, fast-food outlets, snack bars and coffee shops are located throughout Vancouver International Airport. Most shops are located in the international and domestic departure areas. Duty-free shopping is available in the International Terminal, with one outlet also available in the domestic departures area. Left-luggage facilities are available from CDS Baggage Storage (tel: [Domestic Terminal] +1 604 303 4519; [International Terminal] +1 604 303 4500), which is located in the arrivals area of the Domestic and International Terminals. Lost and found items should be registered at the Customer Service Counter (tel: +1 604 276 6104) on level 3 of the International Terminal. Alternatively, an online form can be filled out on the airport's website. Porters (tel: +1 604 834 5916) are available to assist with luggage for a fee. There is a pharmacy, medical clinic and dental clinic at the airport. Those with some time before boarding can make use of the on-site spa services, while there is a 24-hour nursery and children's play areas to keep children entertained. The Plaza Premium Lounges (tel: +1 604 276 6688), located in each terminal, are fitted out with work stations, plug sockets and free Wi-Fi, as well as showers and nap rooms. Full meetings and conference services are offered by the Fairmont Vancouver Airport Hotel (tel: +1 604 207 5200; www.fairmont.com), located above the US terminal. Free Wi-Fi internet access is available throughout Vancouver International Airport. Additionally, a full-service post office is situated before security on Level 1 of the Domestic Terminal. Vancouver International Airport is fully accessible to disabled passengers. Toilets, disabled parking and wheelchair-accessible taxis and inter-terminal shuttles are available to those with physical disabilities. There is a general information telephone line for the hearing impaired (tel: +1 604 207 7070). Any passengers who may require additional assistance are advised to contact their airline before travelling. The multistorey Parkade is the closest car park to the Domestic and International Terminals; level P1 is for the pick-up and drop-off of passengers, while levels P2 and P3 are hourly, daily and weekly parking. Hourly or daily parking is also available opposite the South Terminal. The economy car park, which is next to Parkade, offers cheaper long-term rates. Additional long-term parking is available at a remote car park that is accessed via a shuttle service. A 24-hour valet parking service operates at the Domestic and International Terminals. Car hire companies Avis, Budget, Dollar/Thrifty, Hertz and National/Alamo have facilities on the ground floor of the Parkade, close to the terminal. Off-site car hire company Enterprise can be contacted at the pick-up location near the economy parking lot.